This page is still under construction and new text and pictures will be forthcoming. Most of the airplanes that I have built in the last 28 years have been painted with Dope and/or acrylic lacquer. Film covering has its advantages but there is nothing any prettier in my opinion than a hand rubbed dope finish. This page will outline the procedures and materials that I have used in the past along with methods that other people have used. The chart below doesn't cover all of the possibilities of compatibility but is a start. The only sure way to make sure that your products are compatible is to test them on a scrap part. One that isn't listed on the chart is Nitrate and Butyrate dope. Butyrate will go over Nitrate but Nitrate will not go over Butyrate. I have been told that Nitrate is not fuel proof but have never tested this. Film Coverings The major drawback with film coverings (Ultracoat, Monokote etc.) is the tendency to wrinkle when the wood underneath swells or shrinks with humidity and the covering to eventually lift at the seams or edges when exposed to fuel. Goldberg Ultracoat is less prone to this than Monokote in my opinion although the availability of more colors becoming available have given the builder more leeway in designing an attractive covering scheme. The film coverings definitely have an advantage where time is a factor. They afford a good looking model with minimal effort. Nathan Carter and Bill Pence come to mind when it comes to a beautiful film covering job. It is my intention to solicit their articles on film coverings for this web page in the future. Sand, Sand And Sand Some More. Probably the one skill that is most lacking in modeling is how to use sandpaper. The paint job starts with sanding the structure of the airplane and ends with sanding the clear coat before buffing with compound which by the way is liquid sandpaper. It is imposable to get a good paint job on a structure that has gaps in the wood or seams that have not been block sanded properly. If the structure is tight and smooth less filler is used and a lighter paint job will result. 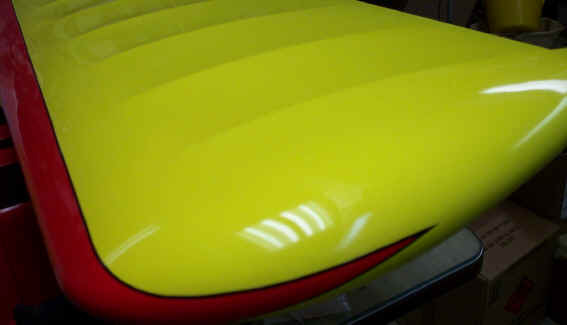 Wavy trailing edges and rippled sheeting will stand out when a glossy paint job is applied. If you are willing to devote some time you will be rewarded with a great looking airplane. Another thing to remember is the skills to paint a show plane will not be developed on one or two airplanes but many. Also applying a light weight painted finish that is shinny takes some practice and skills with sandpaper. I prefer to use sanding bars that are the length of the part that is being sanded such as leading and trailing edges. Square 1" tubes that have sandpaper of different grits such as 100 and 200 applied to opposing sides work well. Once the airframe is sanded and you are happy with the outline now is the time to knock down all of the sharp edges. Even though the plane is straight and the seams are tight, the corners of the ribs, stringers and sheeting around the open rib bays need to be rounded to keep them from cutting through the covering. If the sharp corners are left around these areas the sandpaper will inevitably cut through these areas when sanding the paint or filler coat. I have used 600 to 1000 grit sandpaper for this and they both seem to work well. The finer the grit the less chance you have of sanding away too much material. Now is a good time to sand the sheeting with 600 or 1000 grit sandpaper to remove the fuzz. 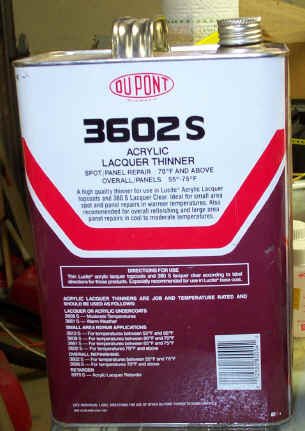 If painting a fiber glass airplane or part I use 320 grit to remove the gloss of the fiberglass before priming with automotive lacquer primer. If priming small parts like cowlings or wheel pants the automotive primers in a spray can work well. Fillers And Putties Try to keep the airframe tight to keep the fillers to a minimum. If filling the bare wood and the gap is not to large microballoon putties work well and are light. These putties are not strong enough in my opinion for fillets. Auto body acrylic lacquer putties work well for small imperfections but are heavy. These putties blend to a fine feather edge easily and dry rapidly. The acrylic lacquer putties from 3M come in Red Green and Blue colors. The drying times vary from slow to fast. I have used mostly the blue and green. Since these putties are a lacquer base they adhere to the dope finish in case you need to fix a ding when the plane already has paint on it. I have never used the Bondo fillers since I feel they are too heavy for model airplanes. I have always applied the fillets after the plane is covered and primed so as to keep the paint buildup to a minimum. where the fillet is to go keep the paint buildup thin. I have had trouble in the past with too much primer and or dope building up on the fillets and causing the paint over the fillet to bubble or lift. Only one coat of primer or dope filler is applied to the top of the fillet before painting. For fillets of 1/8 inch or more I use a blend of epoxy and microballoons. Z-Poxy or Smooth and Easy seem to work well for this purpose. Add enough microballoons to give the mix a thick consistency that appears to be dry. Apply the Micro mix with a radiused tool made out of 1/16 plywood. If the micro mix has to be smoothed slightly you can wet your finger with Isopropyl rubbing alcohol. Once the fillet is cured it is sanded with 200 to 320 grit wrapped around a radiused tool to achieve a uniform shape. Sanding the fillet also exposes the microballoons and allows the paint to get a better grip for adhesion. Large R/C airplanes such as Piper Cubs will benefit from the strength of Sig Koverall and appear scale due to the desired fabric weave showing through the paint. Polyspan which is a no woven polyester similar in appearance to silkspan is stronger than silkspan and is a good choice for those intermediate sized R/C projects. Polyspan has the advantage of not being affected by humidity like silkspan and is puncture resistant. The polyester coverings are applied somewhat taught over the airframe and are shrunk with heat. Sig Koverall will shrink tight enough to warp a light airframe so caution should be taken. Polyspan has a more moderate shrink rate. 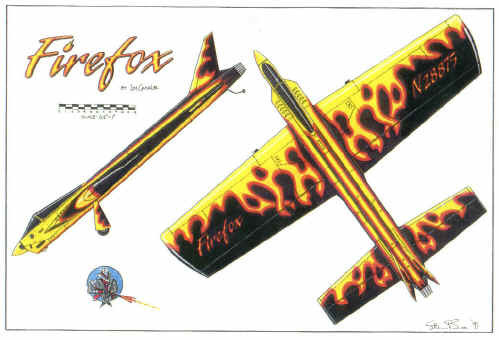 Japanese Tissue has been used extensively by the free flight modelers and was not used by R/C modelers until the indoor radio control models came along. There are products out there that are about the same thickness as Japanese Tissue but are Polyester. These covering materials have the color already added to the tissue. I do not have any experience with these Polyester tissues at this time but have a few small R/C projects that will require them. Below are a few articles concerning the Polyspan covering material. I believe that Polyspan is the ideal covering for mid size R/C airplanes that are going to be painted. Picture of Steve Starr's Impact covered with Polyspan and painted with Sig Dope. Steve was able to achieve a high gloss by wet sanding the clearcoat with 2000 grit sandpaper and buffing with polishing compound. "I can tell you that this is a great covering material..."
The first thing to know is that this is a polyester material and impervious to water so don't try to shrink it with water. The Nitrate dope will shrink if fine and any wrinkles left can be taken out with a MonoKote iron. I started on the stab first and proceeded to follow the brief instructions which came with the product. He recommends pre-doping the frame outlines in the usual method used for Japanese tissue or silkspan which is two coats of Nitrate Dope. I then cut out the Polyspan 1" larger than the outline of the stab and doped it with Nitrate Dope thinned 50% through the material. So far everything went well and the material went on easier than Japanese tissue. Naturally you try to put it on by getting it reasonably wrinkle-free. Then I cut the material flush with the framework with a NEW double edge razor blade. So far so good. I then applied the Polyspan on the top in the same manner and trimmed it leaving the usual 1/8" for overlapping. Then came the problem. The material does not want to be rolled over the edges in the usual doping down method. It kept trying to straighten out the overlap and no matter how hard I tried, it would not roll over. I called Sal Fruciano and asked him for a remedy to the problem and he said that using a Monokote iron to crease the material should help. Well, he was right and the following was the method which worked great for me. Before putting the dope on the edges to be rolled over, I used the Monokote iron and creased the edge as Sal suggested. Then I put the Nitrate Dope under the overlap and rolled it over with my fingers in the usual fashion. It will still try to come up and by running my fingers around the edges until the dope is almost dry to the touch, I then took the MonoKote iron set at about 325 degrees and rolled over the edges to stutter when I use the "M" word. That is because as many know I am a religious silk and dope man. The next step was to brush some of the analine dyed Nitrate Dope on the bottom of the stab. It was difficult for me to believe that you could get the wrinkles out and make the covering tight with just putting the dope on. Well I can tell you that it tightened up great but I did not like the way the color came out on the bottom or the top. It was streaky and I did use a foam brush. Then I noticed that the top looked like the Chia-Pet that is advertised on television as it seemed to sprout fuzz and hair on the top. I wondered why this did not happen on the bottom and finally realized: IMPORTANT: There is an inside and outside to the covering. There is one side to the covering that is more glossy than the other and you MUST put the glossy side on the outside. On the roll that I used, the glossy side was on the inside of the roll and when placing a cut piece on the bench it would try to curl the edges up with the glossy side facing up. I removed the top covering from the stab and put another piece on with the glossy side up. As I said before, I was not satisfied with the orange tinted dope finish which I had brushed in my usual fashion with a foam brush as it looked streaky and mottled. The answer was to spray the dyed dope on. This would not be necessary if you left the material white, which is the only way it is available. Don Reid, after seeing my Country Boy at the GGG decided to try Polyspan and then called me to say he had recovered his house including his wife, Cynthia. Obviously he was impressed with the Polyspan. He felt the best way to dye the material was to use a powdered analine dye. You also may buy the liquid dye 10 parts of nitrate dope to 1 part of dye, however I found that with the orange dye, a 20 to 1 ratio worked great. John says to mix a 2 oz jar of the powdered dye with one quart of methyl alcohol (methanol) and spray it on the material before covering the model, otherwise the dye will also color the rest of the wood of the frame work. You can also use the dye, both powder and liquid in nitrate thinner and spray this on Polyspan before covering the plane. If you use the powdered dye, be sure to use cheese cloth to filter the dyed thinner after mixing it thoroughly. Because this plane had to be fuel proof as I use 40% nitro fuel in my Cox TD .049/.051, I continued with my customary finishing technique of spraying K&B Super Poxy over the two coats of nitrate dope. The fuselage came out fine, but the wing was a disaster. The Super Poxy would not fill the pores I the Polyspan on the bottom. I decided to spray one coat of butyrate dope on the top of the wing to fuel proof it. I assume that if I applied several more coats of the nitrate dope to really seal the Polyspan, the Super Poxy would have worked well. I can tell you that this is a great covering material and I expect that on the next plane I use it on will work well with the techniques I learned on this plane. It really gives tremendous strength to the framework, probably as much as silk does and it surely is a great improvement in strength and puncture resistance over Japanese tissue and silkspan even though it is a little heavier. Wouldn't it be nice if there were a covering material that's strong and stable and just about puncture-proof, and not any heavier that what's being used now? Polyspan, a modern covering for traditionalists. Looking very much like the more transparent silkspan of 30-plus years ago. Polyspan is made of non-woven polyester fibers randomly intertwined, but with a definite grain running lengthwise along the sheet. It isn't as stiff as silkspan or tissue, but rather feels "floppier" and is soft and silky to the touch. Like silkspan and tissue, Polyspan is porous, and needs to be filled with dope. It's perhaps best described as a "paper" made with polyester fibers instead of wood fibers. But unlike paper, Polyspan is waterproof and doesn't absorb moisture. Which means it won't sag and change the airplane's trim on those dewy early morning flights or rainy day flying sessions. And it is tough! Trying to tear it across the grain takes more force than you'll ever put on a model in normal use. It does tear more easily with the grain, but is still much stronger than silkspan, and probably even stronger than silk. Let's put it this way; if you dropped a quarter on it from two fee up, it'd bounce off. Yes, sharp objects will puncture it, but the polyester fibers will resist the puncture growing into a tear. Polyspan is made in Germany, and imported by Sal Fruciano. A roll measures 12 feet by 20 inches, and sells for $15.00. Polyspan is available only in white, but can be colored by mixing dye into clear dope and spraying it on. (The old method of dyeing in colored water before covering doesn't work because Polyspan is waterproof.) Starline by FAI Model Supply sells 2 oz. concentrate dyes in red, yellow, blue, orange and black, at $5.50 per-ounce bottle, which will dye a lot of dope at the recommended one-to-ten ratio. Polyspan can also be painted with opaque dope, of course, or with other compatible paints once it's been sealed with a few coats of nitrate dope. Okay, how heavy is it? I weighed one-square-foot samples on my balance scale (which I'm sure is accurate, but even if not produces usable relative weight comparisons). Polyspan weighs 2.25 grams per square foot, Japanese tissue ("Esaki" white, from Oldtimer Model Supply) weighs 1.125 grams per square foot. Thus, Polyspan is twice the weight of silkspan, and slightly more than twice the weight of Japanese tissue. But raw weight doesn't mean much since these coverings require dope to seal them, and Polyspan is said to need only two coats of 50-50 thinned nitrate to fill it. So I made a 12 x 12-inch balsa frame, and doped the Polyspan to it. Then I thinned Sig nitrate clear dope 50-50 by volume could result in a more full-bodied material, requiring fewer coats.) Two coats began to produce a gloss, and filled most of the grain, but there were still a few small pinholes that could be seen when I held the panel up to the light. It took five coats to completely fill all the pinholes, and by then the surface had become attractively glossy. Obviously, applying many coats to the entire surface just in order to fill the pinholes is overkill, and were I covering a glider or rubber-powered model I would consider two or three coats sufficient (maybe dabbing a little more on the pinholes), especially since the dope isn't needed to make the covering moisture proof. I then removed the Polyspan from the frame and replaced it with a sheet of silkspan. Painting silkspan is like painting a blotter, and the first couple of costs used a lot of dope as it soaked in. By the time the silkspan was sealed and the surface no longer fuzzy, I had applied six coats. Lastly, I repeated the procedure with a panel of tissue, which required three coats to fully seal it. After allowing 48 hours drying time, I weighed each panel. The Polyspan weighed 3.6 grams, the silkspan also weighed 3.6 grams, and the tissue weighed 1.8 grams. In short, Polyspan ends up having the same finished weight as silkspan, but with much more strength, moisture resistance, and longevity. Yes, it's twice the weight of Japanese tissue, which is still my choice for small, light rubber models, but Polyspan is perfect for larger, heavier freeflight, control line, and R/C models. Century 21 Fabric White 10.4 Heavy! Japanese Tissue all colors 0.65 The lightest! Paint Scheme Design There are almost as many paint schemes out there as there are airplanes so this is a very broad subject. There are some rules to follow in designing a good paint scheme but it comes down to what ever the modeler decides. If every plane looked alike it would become pretty boring. Can anyone say ARF? 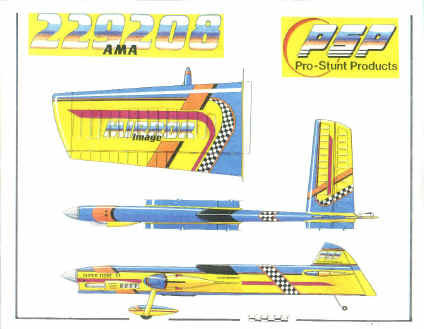 I have included a few of Steve Buso's paint schemes that he designed for control line aerobatic models. The schemes shown below will hopefully inspire you do design your own or borrow some of the things you like and adapt them to your plane. This scheme was designed for Dave Midgley by Steve Buso. The Cardinal airplane shown here was designed by Windy Urtnowski. So if you are looking for this airplane look for the Cardinal. Brodak kitted this airplane as a profile. 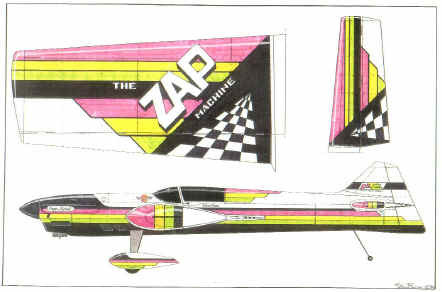 Steve was the one who designed the ZAP Machine scheme that was extensively used for the Lanier Stinger airplane. The airplane shown here is Steve's design that he flew in the Nationals in the late 1980's I believe. 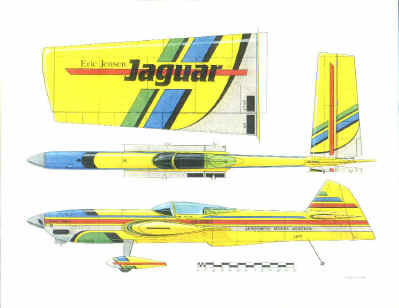 This was another one of Steve's designs the Jaguar. The scheme was done for Eric Jensen. 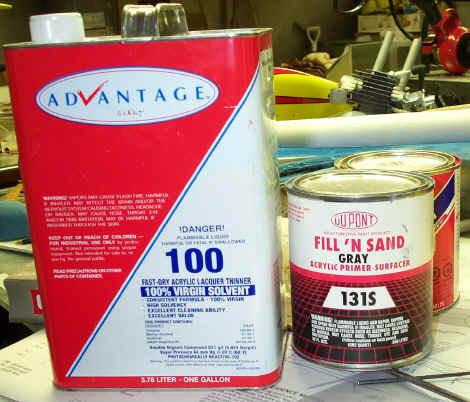 The can of Advantage 100 thinner is for cleaning the gun or thinning the Dupont Fill N Sand to the right viscosity for spraying. The Fill N Sand primer is a fast filling primer that needs to be thinned 100% to 150% before spraying. The Advantage 100 thinner is an off brand that was purchased at NAPA Automotive supplier. The Dupont Fill N Sand is no longer available around the Indianapolis area due to the phase out of Lacquers but there is a comparable Advantage product that I have used with the same results. The Fill N Sand prime works well over silkspan covering , Sig Koverall or Polyspan. Fill N Sand can be brushed on the airplane with satisfactory results if the area is not too large whereas an automotive spray gun will help speed up the process if the plane is large like the 1/3 Spacewalker . Nitrate dope is the dope of choice for the first coats against polyester coverings such as Polyspan and Koverall. The primer can be sanded in about four hours after spraying if the temperature is around 75 deg F. I sand the first coat of primer with 320 grit paper and subsequent coats with 400 grit. Usually only two coats of primer are needed. Sanding through certain areas such as rib cap strips is easily fixed by brushing on the thinned primer. It is important to sand most of the primer away leaving only the low spots on the first coat. Sometimes it helps to thin the primer about 150% on the second coat. Thinning the primer over the recommended amount will cause it to become too powdery with very little hold out. Primer can be made by mixing one part dope, one part talc and one part thinner. Fiber Glast in Dayton Ohio sells talc that is unscented and works well for this purpose. Once the talc and dope is applied and sanded then a coat of clear will help seal the surface for better holdout of the subsequent color coats. If you really want to see flaws in the primer or filler coat spray on a coat of silver and watch those imperfections pop out. Another technique that is great for finding flaws on a painted surface is to candle the surface. Candling is when you let the light bounce off of the surface at a low angle so that it creates a shadow where there are low or rough spots. It helps if there is only one light so the others do not wash out the low spots. This has been my thinner of choice for thinning color and clear Sig dope. It dries relatively fast but not so fast that the Sig dope blushes. I have had good luck thinning the Sig dope about 50-50 or 60 dope and 40 thinner depending on the color and coverage. Since Du Pont is getting out of the lacquer business Sig thinner with Randolph retarder added to control drying time and blush control is an option. Our local NAPA store carries Advantage brand thinners with varied drying rates that work well. I have always tried to limit my dope spraying on days with 60% humidity or less. If the humidity is greater than this then the dope tends to blush. Blush is created when the paint dries faster than the moisture can escape from the paint. Subsequent coats of paint applied when the humidity is lower will allow the blush to escape so have patience and come back later and recoat. It is also beneficial to have the plane warmer than the ambient air to keep the moisture from condensing on it when spraying in cooler temperatures. Everyone knows what happens when they pull a cold drink out of the fridge in the summer (it sweats) and your plane will do the same. Retarder can be added to the paint but adding too much retarder will allow the fresh sprayed coats to soften the underlying coats too much. Cool days in the 50 F to 60 F are good for spraying dope since it dries slower helping the flow out some. Masking an airplane is about 90% of the work in painting an airplane with more than one color. When someone says nice paint job what they should be saying is nice masking job. I have spent hours masking for one color when it only took ten minutes to spray the color. When masking out a paint scheme templates made from see-temp or poster board to guide the tape application come in handy to assure that the design is symmetrical on each wing. Some modelers have used masking tape but only after cutting the edge of the tape with a sharp #11 blade to true it up. I have always used 3M fine line tape available at automotive stores and have never had to apply clear dope to seal the edges from paint creeping under the tape. They don't seal the edges of tape in the automotive paint world so why should we have to. If you are using trimmed masking tape you might have to apply clear to the edge of the tape so sticking with 3M is the way to go in my opinion. When using Friskit film for a mask I do not seal the edges. 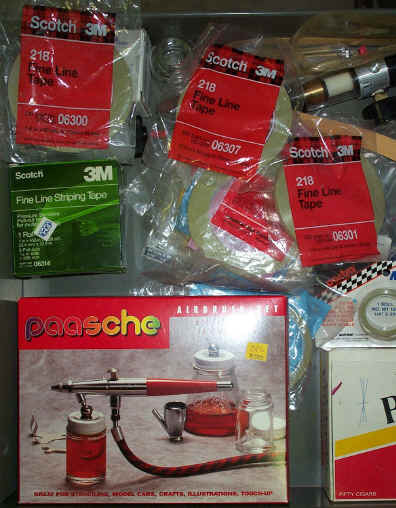 A few of the items that I use while masking off the trim colors. The Paasche double action air brush took a little getting use to but with the right tip it works extremely well with dopes. 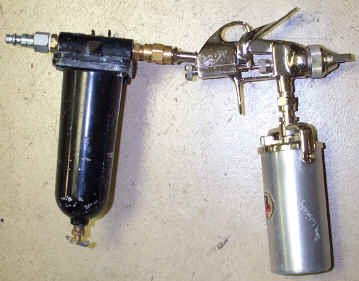 The trusty old cheap Buffalo gun is what I use to spray the primer, color and clear coats. It would help if I had two of these guns where I could keep one for clear only. If using the gun for color, primer and clear make sure that you run adequate thinner through it to keep it clean. Nothing worse than having a red glob of paint come out of the gun while spraying clear over white. The cylinder behind the gun is a filter and dryer. The filter dryer can be mounted anywhere between the compressor tank and the gun but I preferred to mount mine to the gun. The gun can get a little heavy at times but I am assured of clean dry air. If you are looking for a show stopping finish then this is the only way to go. No matter how shinny the paint comes out of the gun to get that plate glass look you will need to sand the clear coat and buff with polishing compound. Acrylic Lacquers and airplane dope shine as well as any two part paints once you have sanded and buffed them. Two part paints such as acrylic enamels and epoxies are harder to wet sand and buff to a nice shine but it can be done. I have sanded and buffed Imron clear coat two days after spraying but dope paint should be allowed to cure for about two weeks minimum. 3M makes a variety of grits for sanding the color and clear coats starting with 600 grit and going up to 2000 or above (I have only used up to 2000 grit). I start with the 600 grit wet until the top shine is broken and there are still some low spots at the bottom of the orange peel which show up as shinny. 1000 grit is used next to get a uniform dullness followed with 1500 and finally 2000. I have an atomizer that I fill with water and one or two drops of dish washing liquid such as Dawn to help the paper cut better. Frequently wipe the water and paint sludge away to see that you are not sanding too deep. A good thick coat of clear is a must for good sanding and buffing. I used a little over 1/2 gallon of Sig clear plus thinner on my 1/3 scale Spacewalker (five quarts total mix). For buffing compound I have found that Brasso works well. Brasso seems to have the right viscosity and gives a nice shine to dope. 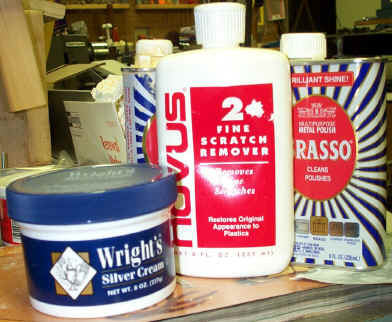 Brasso can be followed with silver or plastic polish if you want an even deeper shine. Turtle Wax and McGuire's products also work well. I have used Turtle wax white polishing compound with good results but my favorite up until now has been Brasso for the initial shine followed with Novus polish. There are different brands of silver polish and they all seem to work well for that final super wet look shine. Here is a shot of the Spacewalker wing tip after sanding and buffing with the compounds shown above. The Koverall was extended around the fiberglass wing tip so everything blends together. The 1/16 inch black striping tape is a 3M automotive product sold at car shops and was applied before the clear was sprayed. Although not visible in the picture there is a little weave pattern under the gloss that will come out more as the paint cures. Usually a few hot days in the sun is all it takes to get the weave to come out. I have finished a few parts of airplanes with fiber glass such as nose sections and the glass will always show through the primer or filler coats eventually. If you are finishing Sig Koverall or Stitts Lite covering do not be afraid to fill the weave and buff since it will inevitable show through anyway.